Ah, finally - you’ve managed to get your foot in the door with that school you’ve been lusting over for what feels like forever and ever! So now it’s time to ensure that you make the best impression you possibly can. Because well you never know, that temporary position that we offered you may in fact develop into that long term dreamy teaching position you’ve been working towards (#ultimatejobgoals). This happens a lot to candidates within our agency, so we’ve come up with a handy advice guide to help you build that perfect relationship with the school. 1) Never ever be afraid to ask for help! You can ask us, or even the school directly for help. Being proactive by asking for advice shows that you’re keen to constantly grow and learn. Not only will you be building the relationship by opening communication channels, but it will also make the role far less awkward as you don’t have to worry about those questions in the back of your head anymore – bliss! 2) Your first day within any school is perhaps the most important day of your life (sorry for how dramatic that sounds, but it’s true). Keep smiling, ensure that you’re on time, and stay positive! Impressions after all are everything no matter what career path you choose, but it’s super important to make the best impression when you’re a teacher. 3) Build relationships with the students in the school, getting to know them is vital! If the children give feedback on how awesome of a teacher you are, the chances are very high that we will be getting a phone call at 7am from the school requesting you specifically to go in. Next thing you know they will be offering you that full time role – although we’d be sad to see you leave our agency HOORAY you’ve made it. 4) On the note of relationship building, also build relationships with teachers within the school too! They will show you the ropes and help you get the specific school essentials down to a T! Every single school is different. You never know, you may even bag yourself a fellow teacher mentor that can give you tips and advice on any teaching related matter! 5) Over planning and over organisation is one million times better than under planning and under organisation. We can all agree on that, right? Even if you organise material that may not be used within that classroom on that day, at least you’re prepared for next time! It will make your day seem less stressful and show the school that you really know what you’re doing. 6) Pay attention to both your weaknesses and your strengths in every single school that you go to. Celebrate your strengths along the way but also use the school environment to gain help with your weaknesses! Practical help will eliminate those weaknesses before you know it and make you that 10/10 teacher! 7) Saving the best and most essential component of our advice guide until last. Make sure you set that boundary between work and your home life. Even if you have people telling you it’s an impossible task to do, prove them wrong and do it! Having time out may seem like a struggle as you can find it impossible to switch off, but it will mean you will feel refreshed and be in a good mindset for your next day of work. We’re humans after all – not robots! 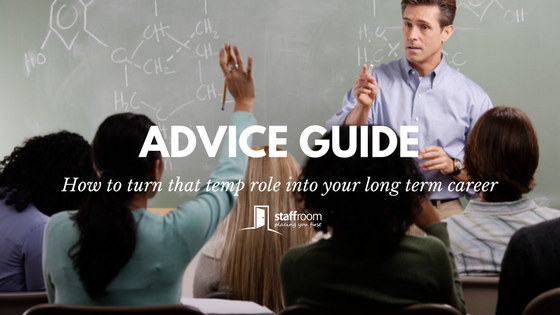 We hope this advice guide encourages you to feel comfortable when it comes to making a long-lasting impression on schools and building that oh-so-essentialrelationship. If you have any more advice to share then please tweet us over @staffroomed.